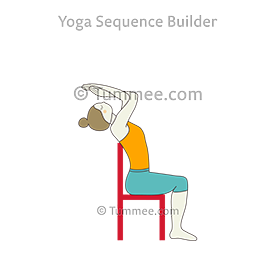 The below cues and yoga sequences added by yoga teachers show multiple ways to do Seated Backbend With Eagle Arms In Chair depending on the focus of your yoga sequence and the ability of your students. D Inhale lift up through crown of head, elbows in line with nose. Lift that structure up in front of your face, rest your chin on your left upper arm, then breathe your chin and your arms away from your face and up. Let the upper back catch the back of your chair; hold for 3–5 breaths. Cross your arms the other way and repeat. Lift elbows, draw thumbs away from face, shoulders relaxed. Breathe. 30 seg. para cada lado, mude o cruzamento dos braços. Evite arquear demasiado a sua lombar (base da coluna).